As per suggestion of a reader & Facebook Fan Dani we've decided to address the topic of "I'm probably going to sell my house next year, what can I do to start preparing?". This is a great topic, because even though it might seem like there isn't much to do, there is plenty! Also, many people often begin discussing the sale of their home long before actually putting it on the market. Hopefully this article will help those still discussing as well as those who are just waiting for their planned timeline. So, what's the first thing you should do when thinking about selling your house? Talk to anyone else involved!!! :) That's right. Ensure that your spouse, business partner, etc. is on the same page. It's possible the topic was mentioned in passing once and one person ran with the other idea and the other one just thought it was hypothetical. It's very important when dealing with big decisions like this, and before wasting time and effort, to ensure everyone is on the same page! Talk to your Realtor. This may seem too early, but there are a couple of things you can ask your Realtor for even at this point. One is a Market Analysis of what your house is currently worth. While this may change in a years time (and probably will) it will at least give you a rough idea. It maybe that your house has depreciated to the point where selling is no longer an option or it maybe that it's appreciated so much that you'd like to sell ASAP. Let's all hope it's the latter. Another is to get information on your neighborhood. Most Realtors should be able to set you up with an automatic search to get weekly notifications of what's going on (new listings, prices changes, etc.) in your neighborhood. This will help you be familiar with the current market conditions. If there's 20 other houses for sale it might not be a good time to get yours listed (unless you can list it down near the bottom of that range). Last thing I'll mention on this point is current trends. While these can also change in a year, what is it that buyer's are looking for? What are the current priorities? Maybe there will be some small projects you could do in your house that will make a big difference. Having a year to get them done instead of a month will help you a ton. Re-prioritize and finish your TODO list. Everyone has one, if it's not on paper then it's in your head taking up mental space and causing stress! Write it down. Take a good look at it. What on that list will make your house sell quicker? What is just stuff that you would like? The latter should no longer be a priority or even on the list if you're really going to move in a year. Now, walk around your house inside and outside. Are you sure you got everything on the list that should be done? Not the 'we'd like to do this' stuff, but the 'man, my yard looks really bad because of this' type stuff. Once you've got the list re-prioritized and probably comprehensive, start tackling it. Try to get to one project a month. There's a good chance just one weekend a month (or even just a week night here and there) you'd be able to get a ton of stuff done! For some people, this won't be a big list, if so, congrats! Lastly, start de-cluttering. This is imperative during staging and I think you'll be surprised how much it can help you clear your mind by having less clutter around also. Have a wall full of picture frames? Consider taking half of them down. Have a shelf full of nick-nacks? Would 1/3 of them be okay? Box it all up and put it in a storage area (closet under the stairs, attic of the garage, where-ever). This really can take some time and by tackling it earlier you're going to make your task of getting your house ready for market that much easier. As a side note, I'd suggest clearly labeling these boxes. When you do sell your home and move, take a hard think if you really missed any of the stuff over the year. If you didn't, maybe it's time to unload some of it and have a light start in your new home! This is not an all inclusive list, just some ideas to get you going. Hopefully they'll keep you busy enough! I'd love to hear suggestions from our readers, what would you do? TV shows are another thing you won't often find me blogging about as we really don't watch much TV at home. We get movies from the library (hey, they're free!) and do watch an occasional thing on the Internet, but there really isn't much we looked forward to. Heroes was one of the few (not even a few really) that we actually followed. Now what are we going to watch? Update: Sounds like NBC is trying to find a way to wrap-up the show, but still disappointing. 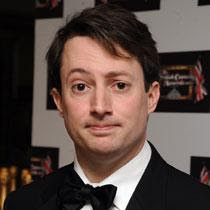 But more importantly, has anyone noticed the striking similarity of Elana Kagan to English Comedian David Mitchell. 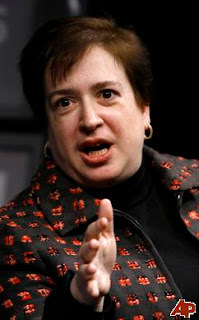 Now, I think David Mitchell's work is brilliant, but I'm not familiar with Elana Kagan's work. What are your thoughts on all of this? Is David Mitchell simply trying to infiltrate the mainstream in America? If so, this is an interesting tactic and seems to have taken years of effort to develop. Well done I say. I'm not talking about our house, though we are doing a lot of work on it. 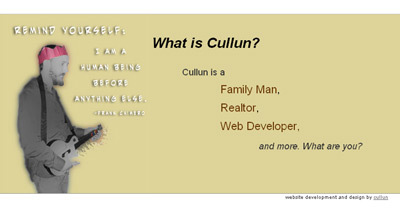 I'm talking about my website, www.cullun.com. This site is more of a portal, than a full fledged website on its own, to the different sites of mine and the different roles I play. This blog is the amalgamation of those persona and that site is the portal to them. If you think about it, we all play a lot of roles in our lives, but what defines us? Just because you work in Real Estate does that mean you are a Realtor? Just because you work as a Nurse that mean you are a Nurse? Well yes, and no. We can all get caught up in titles. When you meet a stranger it's easy to just ask "so, what do you do?". That tells us some about the person, but what we do at a job isn't who we are, only a reflection. It's very similar, if not the same, as stereotyping. These roles we play and categorize people into help reduce the amount of thought we have to put into understanding the person. If you have children, you're a parent. If you live on the streets, you're homeless. It's similar with religious labels: Christian, Atheist, Buddhist, Muslim, Hindu, etc. Those roles that we play as humans are part of who we are, but first and foremost we are all human. If we all took that a little more to heart and looked at our fellow humans that way I think the world would be a better place. Yeah, I know, sappy.